Over the past 20 years, I've been involved in global emergency medicine systems development in over 40 countries. I've been privileged to work alongside of you, training faculty, residents, and students, starting residencies and national EM societies, establishing EM as a full medical specialty, working with Ministries of Health, Finance, Education and Tourism, and with hospital groups, universities, governments and NGO's, all to help build and strengthen local, national and regional EM and emergency care systems. Most of this hard work has been done by dedicated men and women like yourselves, on the ground, day after day, year after year, building upon past successes and striving to make improvements and advances in our EM systems every day. However, I believe the time has come for those of us in the field of global EM development to change gears and to reexamine the way we work. Most of the great work already done in the world of EM systems development has been on a volunteer basis of hard working physicians and academics who are already busy taking care of the world's emergency patients. It's as if we are trying to build a sophisticated race car engine on a car while we are currently driving it down the expressway! I think the days of building EM systems on a part-time basis during free time should be over. I think the world needs an organization that is capable of building national-scale EM and emergency care systems full-time, on purpose, and in an organized fashion. Right now, there is no such organization. Our own universities and hospitals are mostly interested in their own local concerns. Major hospital groups and ministries of health are not yet aware of the huge economic and quality benefits of functional, mature EM systems. Our national and regional EM professional societies are mostly academic and political and are not organized structurally to take on such large projects. Further, most EM professional societies, when faced with the economic necessities and intricacies of running an organization capable of comprehensive EM systems development, quickly become mired in petty gerrymandering, back-room politics, backstabbing, and short-sighted internal gamesmanship. Positions are used as political tools, often bestowed upon individuals with little to no experience in the field of global EM development. 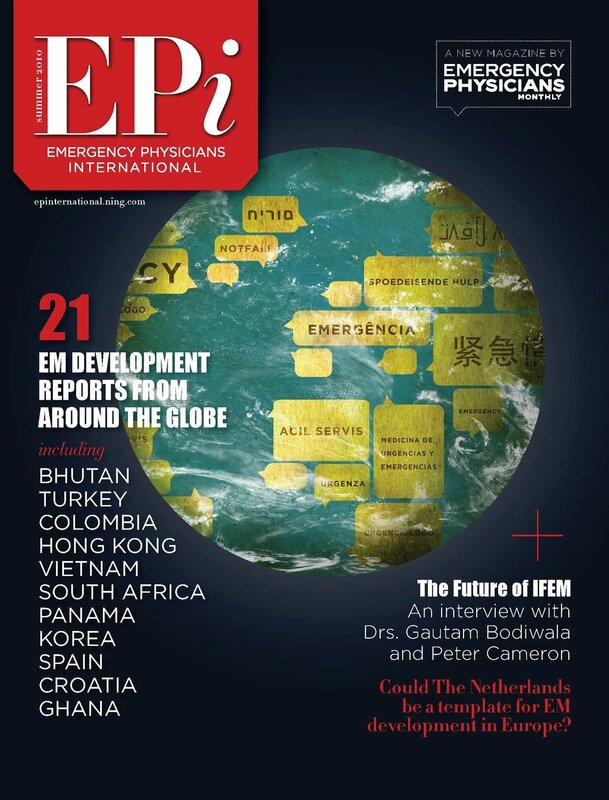 In order to break free of this unfortunate downward spiral, I've long advised my colleagues in global EM development that the world needs a new organization dedicated to comprehensive EM and acute care systems development. Over the past 10 years or so, I've struggled with thinking about what such an organization would look like, and what it would have to be capable of providing. The answer: education, resources and consultation on multiple levels including clinical care, academics, administration, finance, legislation, health policy and public health. For the past five years, I've struggled with just where to plant the flag of such an organization. I know where NOT to establish it: not at my EM department, not at the school of medicine, not the university, not at a global health institute, not at USAID or Gates or State or HHS or the WHO. Not at KPMG or Ernst & Young or Deloitte, and not at any one particular national, regional or global EM society. To establish this organization on our own, for us and by us, with our own goals and visions and missions in mind, for our patients and for ourselves, in the ways that only we know best. I am calling for interest in this type of group, and I am asking if you agree with me. If so, contact me. Together we can move forward towards a world where EM and acute care are a priority and are treated as such, with the time, resources and dedication that they require.